As the summer season comes into full swing, homeowners across Nebraska are looking to create a fun and relaxing atmosphere in the outdoors. From your porch to the property line, every aspect of your landscape has the potential to create beautiful and long-lasting results that are sure to benefit your family as well as impress your guests. Without modern outdoor lighting fixtures to illuminate your exterior upgrades, though, it can all be for naught. Worse, improper lighting can prove to be hazardous! It is important to keep your home’s exterior properly lit at night, both for security reasons and for convenience when enjoying the outdoors. 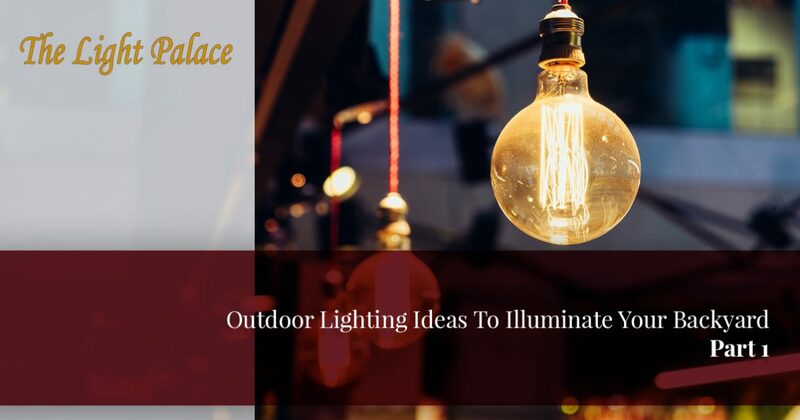 The Light Palace is here to deliver comprehensive solutions in addition to the quality products made available in our expansive lighting showroom. If you’re in need of assistance in optimizing your outdoor lighting, we’re here and ready to help! Since 1953, our lighting store in Omaha has delivered the best services to keep our customers coming back for life. Every home is unique, playing host to different families with different histories. While every space is different, we have picked up a few tips in our experience that may inspire you to start designing your porch and garden for the best use. Today, we’ll highlight a few basic ideas to get you started. One decorative strategy that provides optimal design control is the strategic use of lanterns. These modern lighting options are ideal for setting a relaxing move, and if your space changes throughout the evening, you can easily move these independent products to customize the lumens. Versatility is a key benefit for homeowners looking for different levels of light, as you can choose candles or LEDs as a light source. There are also numerous styles to choose from that can truly customize the ambience of your outdoor space. Securing to the house. Chances are that your string lights require a plug, making the use of your home’s siding the best place to start your lights. In order to encapsulate the space, you can secure the other end of your outdoor lights to another point of the house for added peace of mind. Natural elements. While it is not normally recommended to place your string lights in close contact with organic elements, trees, trellises, and other features found on your property can also be used for a string light scheme. Ambient lighting is an important aspect of your outdoor lighting, especially when entertaining guests. We have found success with LED light strips being placed under stairs, furniture, and columns. Utilizing this lighting option allows you to transform your outdoor space, increasing the quality of the aesthetics while also making the area safer for use at all hours. Step lights can also be handy for security reasons, giving you a cost-effective way to keep an eye on your steps. Illumination keeps rodents and intruders at bay, especially when used in conjunction with other security elements. These lights can also be used in conjunction with accent lighting options for a truly amazing outcome. When it comes to modern outdoor lighting designs for your home, there are almost too many combinations to keep track of. Next time, we’ll continue this topic by highlighting more advice that may inspire you to take on your own property. When used properly, different shapes and styles can be utilized for dynamic looks. You can also light up your household elements such as planter boxes. If you decide to do so, our lighting store in Omaha is here and ready to help! For more than 60 years, our lighting showroom has provided the best products and advice to light Nebraska homes with quality. Contact us today if you have any questions!